Don’t you just long to be told by someone that they are proud of you? Its something that we strongly desire as children without even knowing it and I don’t believe that desire ever truly goes away. I think that its just masked by the shell and the toughened exterior we develop or the coping mechanisms that we employ to ‘cover up’ the need altogether. I always knew I was loved but I don’t believe that I was ever encouraged or affirmed in my childhood. To some extent what we need the most are those occasional moments that we receive from someone that genuine conversation when they tell us how special we are, what we mean to them and how they feel about us, rather than just ‘good boy Johnny’. I have a sense that in my wider family that’s how it was, we knew we were loved but I don’t think we were told how wonderful we were, if they were proud of us for achievements or even just because there wasn’t much spoken out loud, and that would have been the way it was in their family too! I didn’t think it really mattered all that much but even now at 46, I realise that I do crave for this. Telling people I am proud of them, that I love them and all of that comes easily to me, and its easy to give to others too, but for me to hear those words, spoken over me… would be to melt my heart. How lovely would it be to hear those words? Before my mum developed Alzheimer’s those words still didn’t come easy for her but I do remember a few select cards that she gave me on my birthday that had the words I always wanted to hear from her… that she was proud of my and that she loved me. My dad passed away when I was only 15 months so I didn’t have that affirmation from him either. Do you know what that results in? It results in us looking for that affirmation through some other avenue, no matter what that might be, we find something to be good at and and we do that. Or we may spiral downwards and be very negatively affected by all kinds of things like addictions and illnesses. When I look back now I was seeking affirmation, acceptance and approval. All throughout every year of my growing up and most especially in my teenager years when thankfully I was blessed to have good people around me. I sought belonging in friendships and that sense of family and community that was a little less volatile than my own family situation. 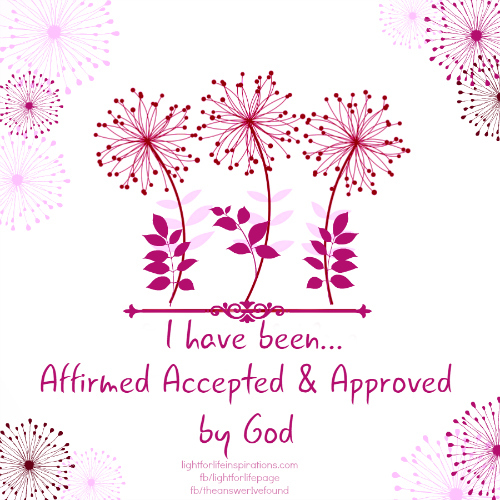 I looked to others for this affirmation, acceptance, approval…. the AAA rating! Seeking this AAA rating from people always causes problems, disappointments, rejections, let downs, hurts. Yes we do need all of this from people, but should we fail to receive this from people the only real source of an AAA rating is from the only one who can give us what we need and that is God, as our Father, as our Papa. I struggled until recently to call God anything other than God. I could call Him Father but it wasn’t in the affectionate sense of the term but in the ‘role’ of Father I could call him that. Please don’t get me wrong but when I heard others call Him ‘Daddy’ or ‘Papa’ it gave me the heeby jeebies. Those terms for God didn’t come easy to me in my relationship with Him. And then a healing place was found. But that’s another long story….Through this He revealed himself to me as my Papa… my Father, One who had all the time in the world for me. He didn’t have anywhere else to be but with me. Precious healing moments. I think this is the voice we long for and when we don’t find it we look for it in many places… when we are younger we may hear it from say a teacher, hopefully from a parent, a boss, a a Pastor, an Uncle, and Aunt, someone who has our respect. We long for them to be proud of us and to tell us… what precious words they are to our ears. Words like warm honey, sweet and smooth, healing, uplifting, restoring! These are the words that He longs to speak over all of us, and as we come to Him he will show us, and He will whisper these words to us, and we will feel his gentle touch on our head, the eyes of love and affirmation that go right into us and can melt the strongest heart. Knowing how he feels for me, and about me is transforming me from the inside out and changing the outside too. Through the sacrifice of His Son we all have this AAA rating. And its the best AAA rating any one could ever ask for and it will last for all eternity. AAA, acceptance, achievements, affirmation, approval, God, life, love, need, parent, proud, rating, words. Bookmark.